… can avoid having to explain Why they broke later on. 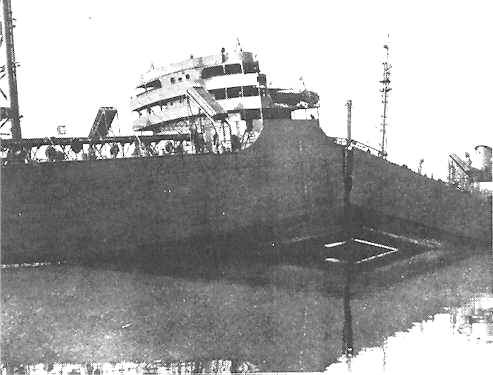 The Schenectady was among many WWII ships that broke apart in calm seas or in harbor due to several factors that included an under-appreciation of fracture mechanics in their design. Little understood, too, was how improper ballast could subject the already vulnerable ship to unsustainable loads. For example, if the heavily laden ship were unloaded unevenly, only from the center but not from either end, the bending moment caused by the downward weight fore and aft, and the upward buoyancy center, could snap the structure – just as you see it in the figure. The TITANIC was “unsinkable.” Here’s a link to TMS (The Minerals, Metals & Materials Society) explaining what went wrong. To return to the Statistical Engineering website, just X-out the new window.